New technology that could protect drivers and passengers from nitrogen dioxide (NO2) pollution in cars is now available and could be introduced in future models. The Airbubbl can cut NO2 emissions within cars. Developed by Airlabs, the Airbubbl technology uses a nano carbon filter and is said to remove over 95% of the NO2 that passes through it, according to product trials in collaboration with the University of Copenhagen. Tests in central London found the Airbubbl reduced NO2 concentrations inside the vehicle by up to 70% with the ventilation turned on and up to 81% with the ventilation turned off entirely. In a timeframe of 10 minutes the Airbubbl reduced NO2 concentrations by over 95%. Air pollution from NO2 and particulates is estimated to cause 40,000 deaths each year in the UK. Earlier this year, a former a former government chief scientific adviser revealed in The Guardian that exposure to toxic air is often far higher inside than outside vehicles. 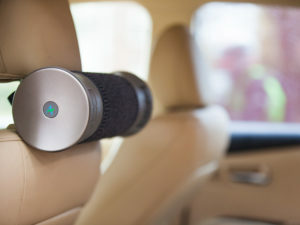 Airlabs is now calling on car manufacturers to build the system, which fastens behind the driver’s headrest and plugs into the car’s cigarette lighter, into vehicles. The technology is also available to pre-order on Kickstarter at £199 with early bird prices starting at £99. Products will be delivered in March 2018 when it will be available to the public at £295.For more of the latest industry news, click here.